Watersmeet is… a nature lover’s paradise, blessed with many rare wilderness habitats protected by the S.E. 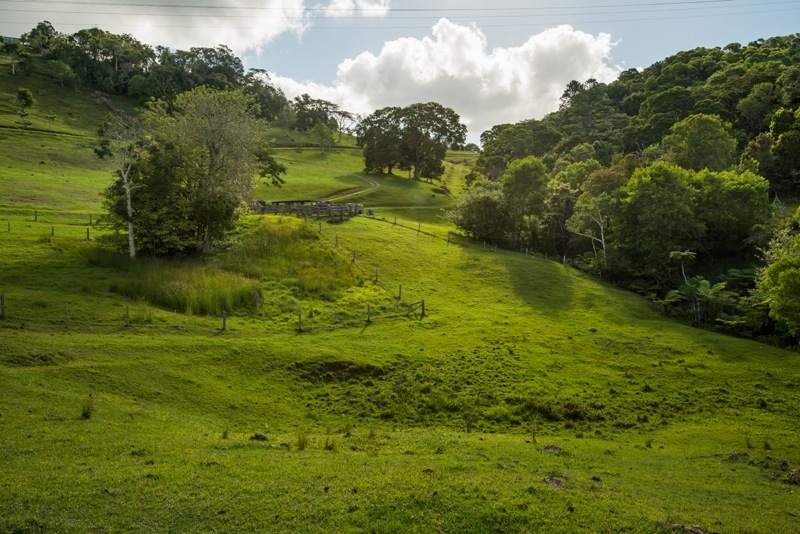 Queensland Regional Eco-Plan and private access to the adjoining Bellthorpe National Park. It is also a part of Land for Wildlife, a nation-wide conservation program that supports the maintenance and enhancement of native flora and fauna. Our guests have spotted wild goannas, wallabies, echidna, even koalas, and countless bird species to name a few. Watersmeet is… the source of Queensland’s beloved Mary River. Its delicious natural spring waters feed Watersmeet’s beautiful pastures and unrivalled biodiversity, including our farm livestock. Both children and adults love watching the cattle and horses, feeding the chickens and geese near the house, and perhaps even finding some fresh eggs in the morning. You can sit on the deck or by the fire with your book, play farmer or indulge in nature by following the trails. Behind and around the home are vegetable and herb gardens, as well as a low maintenance rainforest garden that is a natural extension of the adjacent landscape. Cherry guava, coffee, mulberry, banana, bay leaf, sasparilla and bush lemon trees also surround the home for you to pick your own tasty snacks. For those interested in taking time to understand the bush tucker, there are mushrooms, ginger, rasberries and many species that can be eaten throughout the property.